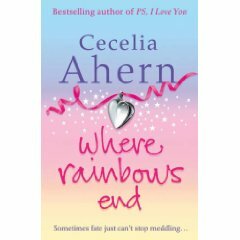 Where Rainbows End by Cecelia Ahern – It's Time to Read! From the no. 1 bestselling author of PS, I Love You comes an enchanting novel about two childhood friends whom fate and destiny can’t help toying with! From naughty children to rebellious teenagers, Rosie and Alex have stuck by each other through thick and thin. But just as they’re discovering the joys of teenage nights on the town and dating disasters, they’re separated. Alex’s family moves from Dublin to America — and Alex goes with them. For good. Rosie’s lost without her best friend. But on the eve of her departure to join Alex in Boston, Rosie gets news that will change her life forever — and keep her at home in Ireland. Their magical connection sees them through the ups and downs of each other’s lives but neither of them knows whether their friendship can really survive the years and miles — as well as new relationships. And at the back of Rosie’s mind is whether they were meant to be more than just good friends all along. Misunderstandings, circumstances and sheer bad luck have kept them out of each others’ arms, but when presented with the ultimate opportunity, will they gamble everything — including their friendship — for true love? Destiny, Alex and Rosie discover, is a funny thing and fate isn’t quite done with them yet! This is a proper chick-lit book. It was weird reading – the whole story is narrated through letters/emails/instant messages. It was strange at first, but once I got used to it I didn’t mind it. This was a very cheesy, predictable book, but I loved it! The story line was not too realistic – the story follows Rosie and Alex and their life – from the age of 7 right up to their 50s; through friendship, countries, marriages, divorces and deaths.There were some crazy stories, such as the marriage in a chat room. And of course, the happy ending, I loved it! I loved Julie Casey and Ruby the best. They were such good friends. Ruby reminded me of one of my own friends, which made the story so real. And of course, I liked Rosie and Alex too! This is a book of love and self-discovery, as well as friendship and family. Although a typical chick-lit book, I did thoroughly enjoy it.